Spacious, traditional cottage in a Conservation Area with character, style, modern comforts and south facing garden. Cambusbarron is a small village within the historic City of Stirling. 1 mile to the city centre. 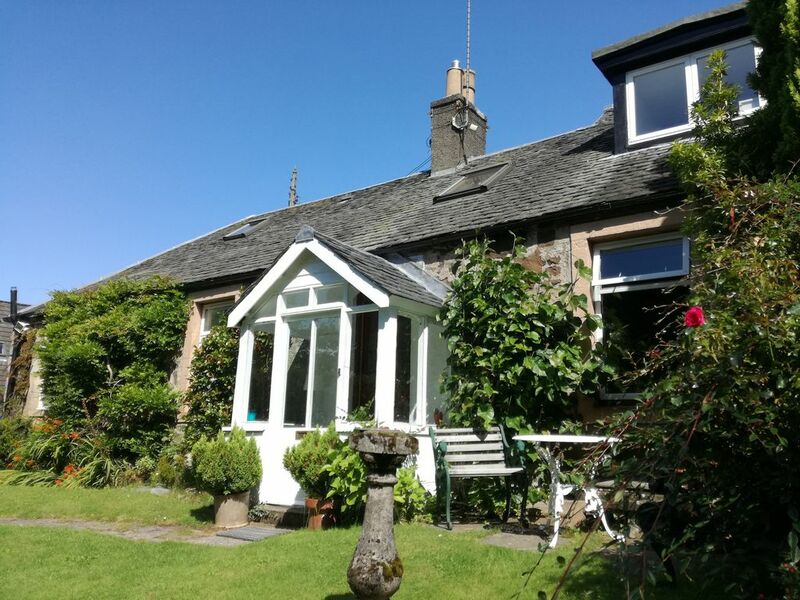 Our cottage is one of the oldest properties in the historic village of Cambusbarron, Stirling. The cottage is a self contained annex of our home. It has an entrance porch, entrance hall, two double bedrooms one with a king-size bed, the other with a double. There is a comfortable lounge and a separate spacious dining room. The fully equipped kitchen includes fridge/freezer compartment, microwave, washing machine and dishwasher. The bathroom has been newly refurbished and includes a large walk in shower. There is also a lovely South facing garden with outdoor furniture. The cottage retains many original features but has been upgraded to modern standards. There is also an off road parking space for guests to use. Complimentary tea, coffee and milk is provided. A travel cot and bedding is available on request. Well behaved pets are welcome. Please talk with us before booking. Guests have access to the entire groundfloor of the cottage and the front garden. Real living flame gas fireplace. Place for one car on driveway. Ample additional on-road parking. Cafetiere and complementary ground coffee provided. A selection of DVDs available. South facing garden with garden furniture. We flew in to Edinburgh from the US on a Wednesday morning. We knew we could not check in straight away, so we did some sight seeing and arrived in Cambusbarron at check in time. Pat, Miara's mother, had just finished turning the place around. We talked with her for a while and enjoyed our conversation very much. Later when Miara arrived home from work, we spoke and she was so kind. All went well. There were a few things that we could not figure out on our own and either she or Sean would help us sort things out. We were only there for two days, would like to have stayed longer. The windows were so clean, it looked like they were open. We did not use the kitchen much, but we're thankful for the things that were there for our use. We did not know that there was a back sun room. We loved being out there. The places is very spacious. There is a Coop nearby, within walking distance, also a local pub that we had too much fun at. wonderful time in stirling.cozy cottage and exceptional hosts. Perfect Location and Charming Apt. We loved our stay in Stirling. The apartment was spacious yet cozy and everything we needed was right at hand. We picked Stirling because it is a terrific, central location -- a little over an hour to Edinburgh and about half that to Glasgow. Stirling Castle was the best castle we visited in our five week trip throughout the British Isles -- so don't miss it! A fantastic cottage in a great location! We will definitely go back! More than satisfied with complete accommodation freindlyness and generosity. Neil and his party were great guests.We would recommend them very much. We had a lovely time staying in Stirling. Mairi and Sean made us feel very welcome. The cottage was very clean and comfortable. It had everything you could ask for. The cottage is in a quiet village and everyone was so friendly. We really enjoyed our stay! Thank you! Monica and her family were great guests. It was lovely meeting them and they would be welcome back any time. We would recommend Monica and her family to anyone.